Bellwood water tower drop is one of the Component drops. It is located in Chicago, Illinois, mainland USA. The clue given with the coordinates to this drop was the word sign. This dead drop has been visited twice, once by drop agent sleepy (handler moosealini) and once by smugmuffin and dadis, with handler air_julio. 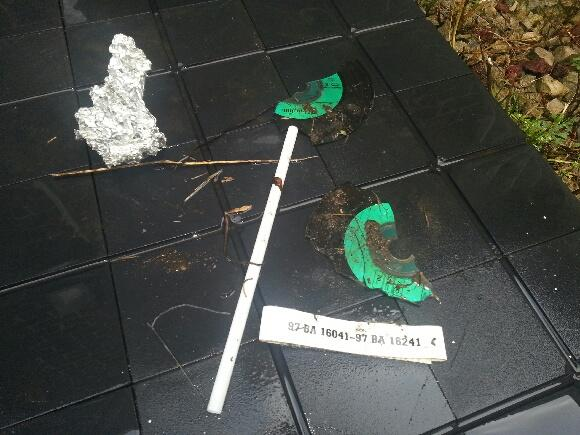 Items have been recovered on secondary visits, however they weren't metal components like we were expecting, but a broken CD and a printed laminated label with a message reading 97 BA 16041-97 BA 16241. Initially it was questioned whether these items were relevant at all, however it turned out that "97BA16041" was the "bell agent code" necessary to reactivate the agent system, as prompted by the 48 22 307 1061 phone number. The drop location was searched on October 16th 2012; the drop site was found to be near the Deltrol company, the water tower, Bellwood road service company and gas pumps lined up North to South. The northern gas-pump had the words "how how how how/Know" written on it in dust. Despite the two-hour-long search, nothing resembling a dead-drop was found. Upon arrival, the water tower is immediately spotted north of St. Charles Street. After walking down a block of residential houses, there were two businesses on the east side of the street, and one abandoned building on the west side of the street. The abandoned building on the west, and one could on the west side not be identified. However, the other on the west side identified as a “street maintenance” business. This business was immediately adjacent to the water tower. At the end of a block, there stood a business with large sign reading “Deltrol Fluid Products.” The water tower was thoroughly searched, with several possibilities following the clue “SIGN”. However, at the exact coordinates given (N41.8891 W087.8695) there was only a small space between the water tower and the street maintenance building. A piece of wood measuring approximately 2.5 feet wide by 1.5 feet tall was found. Said piece of wood was examined, but no drop was found. On the east side of the tower between it and the Railroad tracks, there were three gas pumps lined up north to south. On the east face of the north most pump, there was a note written in the dust reading “How How How How Know” Picture was taken of said note and is seen here. The train signal up on the tracks was searched as was t large thicket of dead bushes that ran parallel to the tracks. The alley parallel to the tracks was then searched. Also with no avail. At this point, the Deltrol building was more closely inspected. Handicapped parking signs, no smoking signs, all were searched. It should be noted that the largest sign in the area (the Deltrol Fluid Products sign) could not be sufficiently searched. As it was in an unreachable area, and had a security camera directly facing it. The search progressed for approximately for two hours, until a Bellwood police officer arrived and I was told to leave the area. On October 23rd 2012, the drop site was visited by drop-agents smugmuffin and dadis under guidance from air_julio, where they managed to find a broken CD and a piece of paper reading "97 BA 16041-97 BA 16241" (see gallery below) near the drop coordinates. Our Broken CDR is from series Verbatim CDR x52 Data Vinyl (or verbatim digital vinyl cdr). It has original Green label. Those CDRs are sold with labels of six different colors. Different colors. And they were using different label during production years. Maybe we could be able to determine what year CDR was produced based on Label. According to this page (German) verbatim.de, theay were making them from SCCG CD/DVDR '03 - '09. This CDRs are high quality. "Excellent resistance to UV light Archival Life: Extra Protection - up to 40 years; AZO - up to 100 years." and I am using pack of those for almost ten years in my car (not clean environment, not in box, they are jumping around among all other things in glove box) and I can confirm that they are really resistant. If upper layered with data and ridges is peeling away, as it appears on the picture, then Chicago CDR must be laying there for months if not years. We have to ask Dadis in what condition CDR parts were when he found it. Do you think that somebody who would accidentally find our drop CD would brake it in half and throw on the ground? I would at least to stick it in my car if not computer to see what data is on it. Cached 2019-04-20 22:45:32. This page was last modified on May 28, 2014, at 04:31.